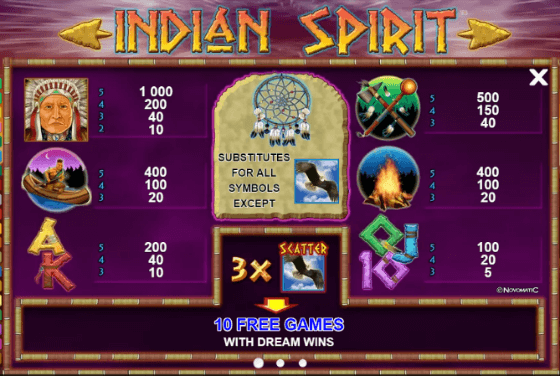 Indian Spirit is a great online slot machine developed by Novomatic. It is not as popular as Book of Ra Deluxe or Sizzling Hot slots, but definitely one of the favorites. For years it’s been a very popular land based slot and could be found in most European casinos, but only in 2012 Novomatic finally launched the online version of Indian Spirit slot. We will start with the bottom line: the official RTP Indian Spirit online slot is 95.34%, which is ok. It’s not as high as some of the Best Paying Gaminator slots, but definitely higher than the 88%-92% that you will get playing this game in your local casino. However, Indian Spirit can be tough. I mean really tough. You can play this game for an hour without getting any decent payout. (By decent I mean 50x total be or higher). So you might ask “Why to play this slot at all?”. The answer is the free spins. During the free spins additional Wilds are added to the reels, combined with relatively high paytable those can be truly rewarding. The problem is that those free spins are pretty hard to trigger and demand a lot of patience and reasonable balance management. 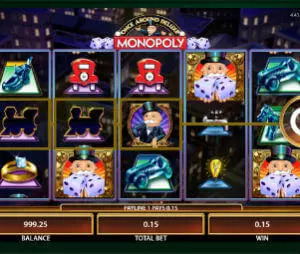 If you manage to do that and get lucky during the free spins, you can walk away with nice winnings. You can see how the free spins look like at the video below. The theme of this slot is taken from Indian (Native American) scenery. The special symbols are the Eagles, which are the scattered and the Dream Catcher, which is the wild. The highest paying symbol is the Indian Chief. Five of them will get you x1,000 your bet per line. The Tomahawk is worth x500 and the Canoe will get you x400 your bet per line. As in most Novomatic slots, Indian Spirit slot also offers a Gamble feature. You will need to guess the color of the card pull out of the deck. If you guess correctly you will double your winnings. This can be done 5 times in a row. To trigger the Free Spins you will need to get three Eagles on reels 2,3 and 4, which will award you 10 spins. As we’ve mentioned, during the free spins additional wilds are added to the reels. This feature is quite fun and rewarding, and the authentic singing sounds at the background are a nice touch.